Food & Energy Concept provides jobs and education, food and energy and infrastructure where they are urgently needed. European technologies and through PPP partnerships with the industry, long-term and reliable management of the projects, ensure the investment. Our goal is to work in partnership with local partners and universities in your country, in the realization and operation of “SUNfarming Food & Energy Training Projects”. 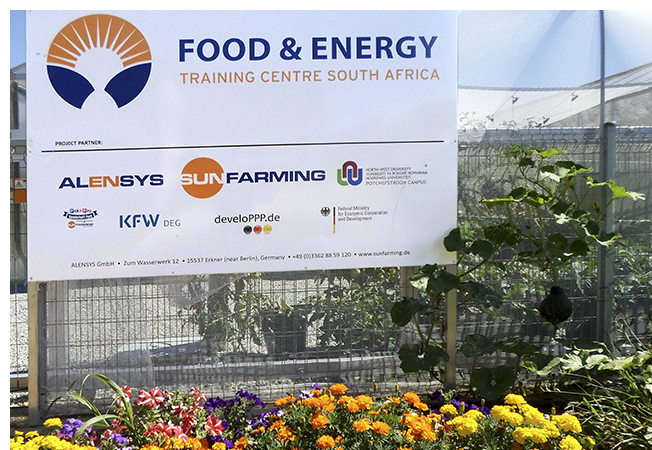 The SUNfarming Food & Energy Project is a PPP project that was implemented by the partner company Alensys in South Africa for the first time with the help of KfW / DEG on behalf of the German Federal Ministry for Economic Cooperation and Development. This unique combination ensures effective food production and, at the same time, a sustainable energy supply through photovoltaics. The Food & Energy Training Project provides knowledge transfer in food production in greenhouses for master trainers and students. In resource-poor areas or in crises, people from the region are trained as foremen in special food production in food & energy facilities. The income situation of the people is sustainably improved. The project is funded by the European Social Fund (ESF) and the Federal State of Brandenburg via the Brandenburg Ministry for Labour, Social Affairs, Health, Women and Family (MASGF). The innovation assistant supports the management in adapting the Food & Energy Concept to the prevailing local conditions, handles applications for the further development and implementation of Food & Energy Projects, develops cooperations and supports the integration of research facilities at home and abroad. Based on their own developments, SUNfarming and its sister company SOLprime have developed a unique agro-solar substructure for greenhouses for Alensys. The roof is partly covered with solar modules for energy production. 15 agro-solar greenhouses have been installed on the site of the NWU University and can be used permanently for practical training and research. This unique combination ensures effective food production and at the same time a sustainable energy supply through PV. The Food & Energy Training Project provides knowledge transfer in food production in greenhouses for master trainers and students. In resource-poor areas or in crises, people from the region are trained as foremen in special food production in food & energy facilities. The income situation of the people is sustainably improved. 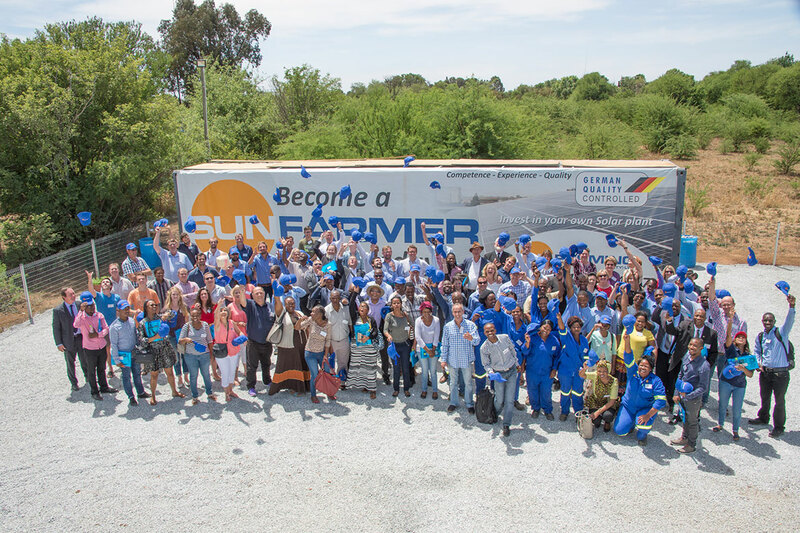 SUNfarming/Alensys and North-West University have officially opened the first Food & Energy Training Center in South Africa. More than 150 guests from the worlds of politics, business and universities from across Africa participated in the opening ceremony on the NWU campus in Potchefstroom. 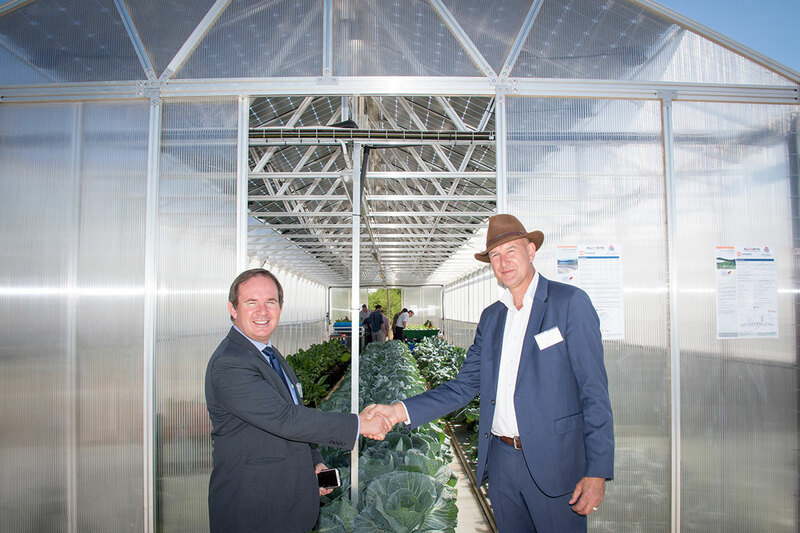 After Prof Frika J van Rendsburg, the rector of the NWU, had cut the ribbon, the guests had the opportunity to visit the solar greenhouses, accompanied by knowledgeable experts who answered all questions. In his speech Prof LJ Grobler, Dean of the Faculty of Engineering, emphasized the university’s special role as a research and development university for renewable energies for a sustainable cohabitation. All delegates showed great interest in the possibility of a partnership of your university in this unique project. The North West University, emphasized its desire to operate as a nucleus for the partnership-based exchange of knowledge between the universities involved. Master students from all African countries are trained in the Train-The-Trainer courses in Potchefstroom by SUNfarming specialists in Food & Energy. The new Master Trainers in your country can pass on this knowledge to students and people from the region. First statements of interests between universities and SUNfarming were successfully signed. “The students trained here at our first and unique Food & Energy Training Center can help us multiply the investment in Africa. We see the collaboration with the NWU as a development center for other universities and partners, “said Peter Schrum, principal shareholder and founder of SUNfarming, in his speech to the public. Our goal is to work in partnership with local partners and universities in your country, in the realization and operation of “SUNfarming Food & Energy Training” projects. Long-term partnerships between universities and local education institutions, communities and SUNfarming with the focus on food and energy, providing the latest agricultural technologies. Partnership for the training of local people in the fields of agriculture, solar energy and e-mobility systems with high-quality materials “German Quality Controlled”. Development funds, PV energy funds, banks, private investors. German technology and know-how in energy and agricultural engineering. Quality controlled organic vegetables are produced regionally. Guaranteed freshness through short transport distances. Only short-term intermediate cooling required. Direct supply of local markets. The role of public institutions is crucial to the success of the project. SUNfarming is convinced that Power Purchase Agreements with local governments guarantee a successful basis for long-term cooperation.